Yorkhill continued on his upward trajectory at the weekend. The weekends racing may have been significantly curtailed by the weather but what remained still provided plenty in the way of top class action and gave us more than enough to talk about once the dust had settled. The biggest loss, of course, was at Ascot where we were robbed of the Grade One Clarence House Chase, although that contest has been re-arranged for the forthcoming trials day fixture at Cheltenham. An altogether different test than the one Ascot will have provided but at least the race will be run and it certainly adds an extra dimension to what is always a serious days racing. The galloping grey may well have been beaten at Haydock on Saturday but for me the run was plenty better than it looked and than what many are giving it credit for. Indeed the run was another career best for him on the RPR scale (156, +3lbs on his last effort) and he’s now fired in a career best each time he has tackled fences. The main reason the run needs marked up is because the Nicholls yard are still surfing their January lull. The figures for team Ditcheat since January 1st now read 4/35 | 11% S/R, which is 38% below expectation. I covered this in-depth last week but it’s worth reiterating again in light of Politologue’s effort. If you look at Nicholls runners in the past 14 days only two have run above standard and that’s this lad and Modus. The rest have all run below what has been expected, albeit Overland Flyer (who won at Taunton) is also worth noting, although there was no standard to compare him to as he was making his rules debut. When there are stand-out performances during a yards lean spell it’s worth noting and despite Politologue suffering a defeat here he did, for me, take another impressive step up the chasing ladder. The second reason for marking the run up is that the horse he was beaten by, the Malcolm Jefferson trained Waiting Patiently, is also an extremely exciting novice chase prospect and the Nicholls horse had to try and concede him 3lbs on this occasion. That might not seem much in the grand scheme of things but in the formative years every pound counts and Waiting Patiently has the potential to be more than just a northern circuit bully, he could very easily be dining at the top table in the coming months and, indeed, seasons. He even made my own ‘Alternative 20 to follow‘ list at the start of the season and he’s been massively impressive on all three chase starts to date. For a triple Grade 1 winning hurdler who is also the only horse to lower the colours of Yanworth over timber and is two from two in his new discipline over fences, it’s slightly bemusing how people are quick to knock the 7yo Presenting gelding. In fact it has to be pointed out that he’s only been beaten once in his entire rules career to date, when over the top for the season at last year’s Punchestown Festival after having nailed both the Cheltenham & Aintree Spring Grade 1’s over 2 & ½ miles. Yet people are still keen to get on his back. Sure, he could have been better at his fences on Sunday and he could have been smoother all round but it was only his second start over the larger obstacles, he’s entitled to still be learning his craft and honing his skills. He never looked in serious danger of not winning and I would say he was comfortably on top come the line. Similar to Paul Nicholls, Willie Mullins is also experiencing, for him anyway, a slight drop off in winners and strike-rates since the turn of the year. His figures for January currently read 6/46 | 14% S/R, 54% below expectations. Hardly in the depths of despair but for a man of Mullins might it certainly can be classed as a ‘lean’ spell. With that in mind, and similar to Politologue, I’m inclined to mark the run of Yorkhill up a few pounds. Post race there has been a lot of talk about where Yorkhill may or may not run at this year’s (and next year’s) Cheltenham Festival but in all honesty I really couldn’t give two hoots! I’m not sure why anyone should? Mullins has made a name for himself as one who switches targets at the last minute so no-one should be upset/surprised when he tinkers with his string (ooh er missus!? ), he’s well within his rights to do so. He wants the best for his horses and he wants to give them the best chance of success, it makes sense to keep his options open and his thoughts fluid, in fact that thinking is probably a major part of his success as a trainer. If he has set a horse’s end of season target in the autumn and then doggedly stuck to it in case he ‘pissed off’ a few people I very much doubt he would be anywhere near as successful as he is. Ante-post betting is full of a multitude of risks, hence the reason for getting an inflated price, backing a Mullins horse months in advance probably comes with more risks than most, everyone surely knows that by now, he has a track record of saying one thing and doing another. And again that’s fair enough, he isn’t duty bound to stick to his thoughts and early plans. They are not set in stone. They don’t have to be. We shouldn’t take them as gospel. He’s not taking his own words as gospel, they are merely his thoughts at that exact moment in time, the thoughts the press and punters DEMAND he gives. Nigel Twiston-Davies’ 6yo routed the Peter Marsh Chase field on Saturday in imperious fashion and in the process threw his hat into the Cheltenham Gold Cup picture. This was only the French bred geldings second try at 3 miles, after a solid second in the Rehearsal Chase at Newcastle in November, and with a yawning 22L gap back to the remainder come the line you could only but be impressed by the performance. The handicapper has reassessed him after the victory and stuck another 12lbs onto his rating, boosting him to a career high mark of OR 166, a mark that, in my opinion, puts him bang in the Gold Cup picture. The Gold Cup has always been a strong contest on the Trends front and the cut off on the official ratings, for me, comes at 166+, a mark that Bristol De Mai now handily finds himself on. 13 of the last 15 winners have come into the Gold Cup rated 166+ and at the minute there are not many entered for the race that pass that trend, I make it six of the 39 that are currently in the pot sit on OR 166+, plus a couple more who just bobble 1 or 2 pounds under (I’d be willing to give them a free pass to the 166+ table). Don Cossack, Valseur Lido & Coneygree would have been in the 166+ group as well but they won’t, as we all know, be lining up in this seasons renewal. Bristol Me Mai’s Peter Marsh win not only ticked the rating trend but also, on my figures, checked off SIX other important Gold Cup trends and in the process shifted him from a Trends Pretender to a Trends Contender, all in one glorious 22L Haydock romp. Before we get too excited, however, his Dosage figures are not as hot for the race…. Crucially, however, he isn’t in the Dosage Red Zone for the race. Had he figured there I would have been downgrading his chances of lifting the crown, as it is, though, he’s flitting between the ‘Can’t be discounted’ & ‘Not ideal’ zone’s and although ideally you want them in the ‘Prime’ zone for the Gold Cup I won’t be marking a major negative against him on this angle. A case of ‘could be better suited but wouldn’t offset the Dosage balance too much should he win‘ type of fella! He’s still only a 6yo (Long Run the only 6yo in past 20 years to win, but then again only four others have tried) and the Gold Cup is a big step up for him, however, it’s not as if he’s devoid of Grade 1 experience (has run in 5 G1’s previously and returned form figures of 13212) and despite what some say last years JLT form (in which he finished second) has actually been working out quite well (race has produced 9 winners and 9 further placed horses from 35 subsequent runs and only the winner, Black Hercules, has really let the form down). thoroughly good read as usual, but i have to say i do not get where all this hype around Bristol De Mai for the Gold Cup has come from. For me, it will need one of three remote and highly doubtful possibilities to happen on the day for it to even have a sniff. To be honest it’s probably an indictment of a pretty poor year quality wise (Thistlecrack excluding), but if this wins the Gold Cup i will do a Lineker at work the following Monday! 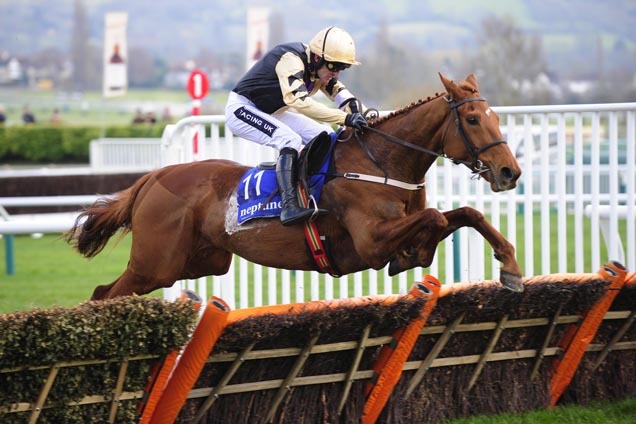 It is a good, solid yardstick, capable of picking up decent races, but a Gold Cup Winner? For starters, which is the correct line of form with “Otago Trail”? Similar tasks on last two runs in the last month, but vastly different results. I would suspect the Haydock gluepot played to BDMs strengths, and when conditions are like that at Haydock, for me the visual impression is regularly misleading with a view to future form. Soft at Newcastle is not Haydock “Soft”! Prior to that, beaten in a match by “Seeyouatmidnight”, already found out as being below top class, and tailed off by halfway in the subsequent Betfair chase. Notwithstanding it was first run of season, but was sent off 2/5 to beat his sole opponent. Prior to that for me he was disappointing at Ayr, and i expected him to beat Le Mercurey, another “journeyman” just underneath the top class. (Otago Trail 3rd beaten 20l at levels). Keep up with the weekly reviews and reports, they give some great insight, and after a ropey early period, the 3 month combo of Fahey and Co. at the end of the Flat season that you suggested following, certainly paid dividends, so many thanks for that. I agree the massive turnaround with Otago Trail was a slight puzzler…until you hear that BDM had a breathing op between Newcastle & Haydock! Something that was not mentioned (as far as I’m aware) until after the race on Saturday. If, as it seems, the breathing was stunting him fulfilling his full potential then he suddenly becomes a very interesting proposition. Granted he still has to step up plenty on what he has done to date to win a Gold Cup but he very much untapped over three miles and I don’t think he’s purely a soft ground type. In truth it may be wise for them to swerve the Gold Cup this year, allow him to continue maturing and progressing, and then gun for the 2018 renewal. Cheers and great commenting from yourself, nice and chunky and opinionated.